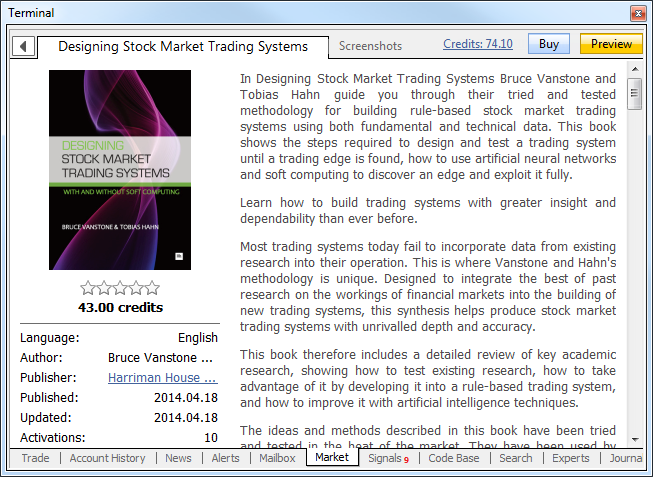 Market: Another new product category has been added to MetaTrader AppStore following trading and financial magazines - Books. 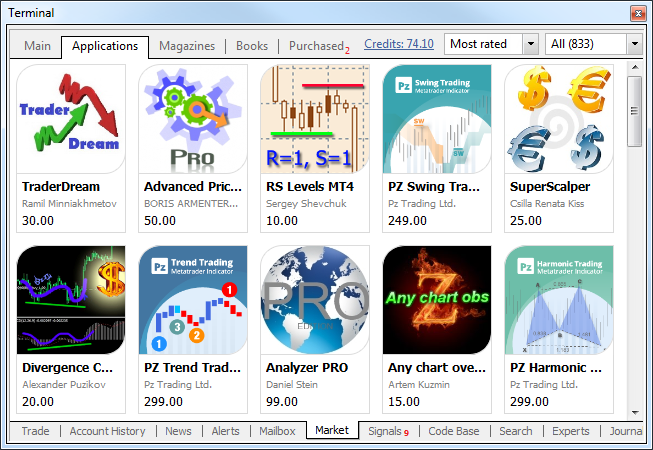 Now, you can purchase the works of well-known traders and analysts along with trading robots and indicators. The range of books is increasing daily. 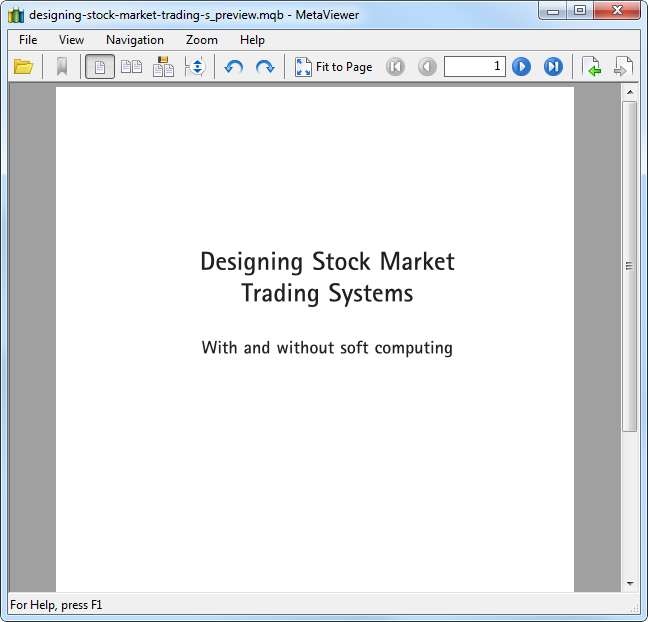 The special component called MetaViewer has been added to MetaTrader 4 terminal allowing users to view book files. MetaViewer is a convenient application for viewing books and magazines in MQB and PDF formats. Keyboard arrows are used to turn over the pages: left and right arrows - for page-by-page navigation, while up and down arrows - for scrolling. Terminal: Increased the number of supported email service protocols. 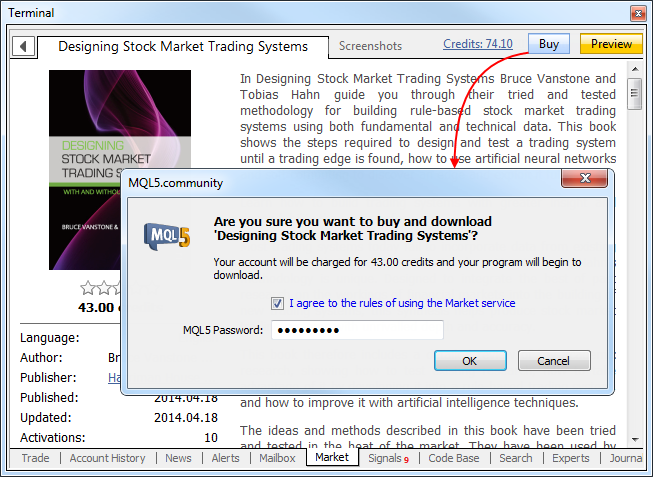 Now, alerts and emails from MQL4 applications can be sent to Gmail, Hotmail, Yahoo and other mailboxes. Set the target mailbox in Email tab of the terminal settings. Terminal: Fixed highlighting a client account status in Trade tab when the account runs into stop out. In case of margin call or stop out, the status bar is highlighted in red. Terminal: Fixed texts in trading dialogs when using the Japanese interface. Terminal: Fixed managing stop loss and take profit levels. It was impossible to move the levels with a mouse if a stop level price coincided with the one, at which position had been opened. Terminal: Fixed working in Wine (Linux and Mac OS). Market: Fixed the errors occasionally interfering with buying and downloading MetaTrader AppStore products. MQL4: Added ability to set width, style and color of all the lines in Colors tab of a custom indicator dialog window in case that indicator has more than 8 buffers, while it was possible to configure not more than 8 lines previously. 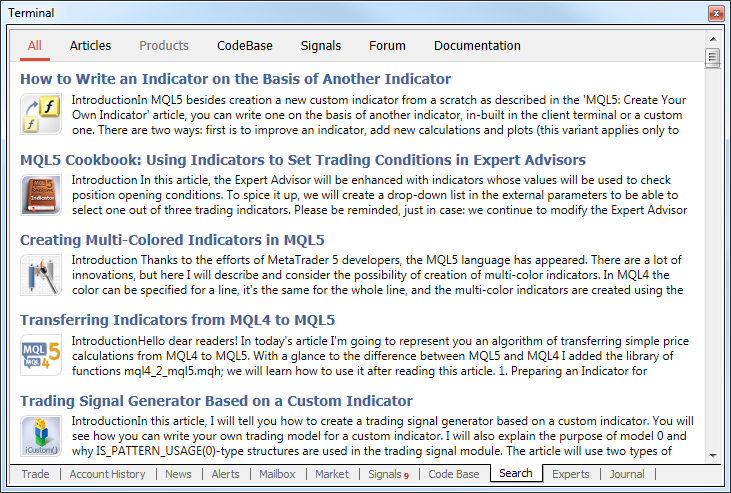 MQL4: Fixed downloading indicators from the resources of compiled MQL4 applications (.ex4 files). MQL4: Fixed FileFindNext function operation. The last character was missing in the returned file name. MQL4: Fixed the two-times call of OnInit entry point after changing MQL4 application parameters. Now, OnInit is called only once in the mentioned case. MQL4: Fixed behavior of OBJPROP_XSIZE and OBJPROP_YSIZE properties for Label and Text graphical objects. Previously, 0 was always returned instead of the appropriate values. MQL4: Fixed the call of OnDeinit entry point after MQL4 application initialization error in OnInit entry point if #property strict is used in the application. Previously, OnDeinit function was not called in the mentioned case. Now, it is called with REASON_INIT_FAILED parameter. MQL4: Changed StringSplit function operation. Previously, ";A;" string was split into NULL and "A" substrings using ';' separator. Now, it is split into "","A" and "" substrings. 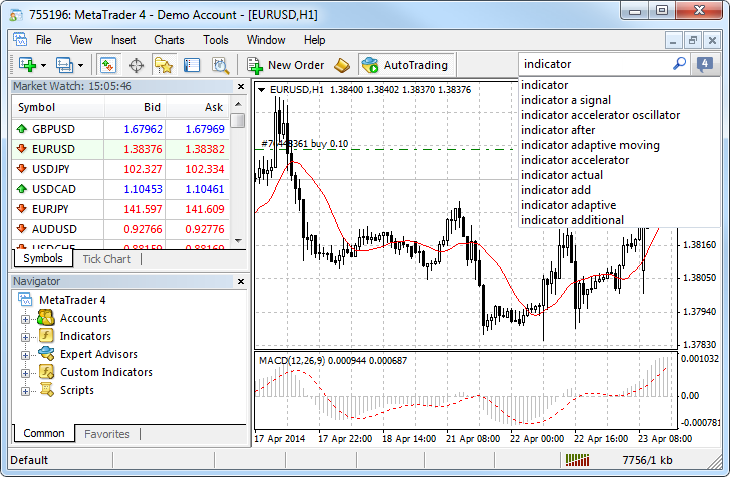 MQL4: Fixed display of MQL4 applications' Boolean parameters. Signals: Added conversion of deposit currencies between a signal source and a subscriber using comparison of synonymous symbols. In other words, not only EURUSD can be used if you need to convert EUR into USD. If EURUSD is absent, synonymous symbols, such as EURUSDmini or EURUSDecn, will be used. Signals: Fixed updating the signal list. Signals: Fixed forced closing of positions and termination of a signal subscription when trade account's Equity falls below the value specified in the terminal's signals settings. Previously, positions were not closed in the mentioned case. 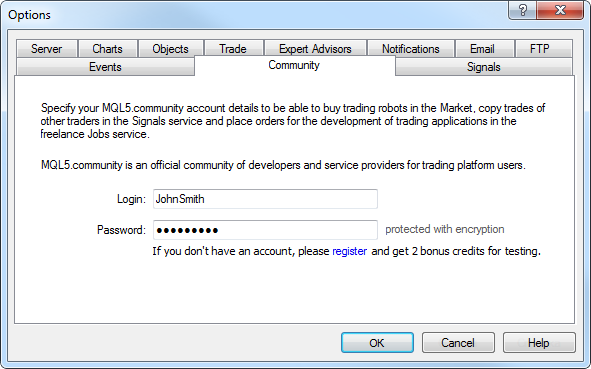 Signals: Fixed trade account synchronization after attempts were made to open or modify positions according to a signal during weekends. Tester: Fixed the value returned by SYMBOL_TRADE_MODE symbol property. Previously, SYMBOL_TRADE_MODE_DISABLED value corresponding to trading prohibition for this symbol was returned during the tests. Now, SYMBOL_TRADE_MODE_FULL value is returned for this property. Tester: Fixed the value returned by TimeCurrent() function in the custom indicators involved in visual testing. Previously, 0 was always returned instead of the test time. MetaEditor: Fixed profiler operation in case the profiled application is forcefully stopped. Previously, profiling data was not received, while "profiler data is not ready or corrupted" message appeared in the journal. 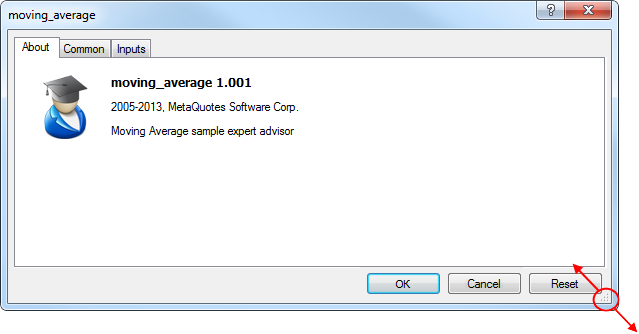 Connect to MetaQuotes-Demo trade server (demo.metaquotes.net:443) in order to update the terminal to the preliminary build. Instead of the improved and useless search box placed in the GUI corner far away from the result pane, I would appreciate if I could hide/remove the "Company", "Market", "Signals", "Code Base" and "Search" tabs. Though I am agree with it, it is not gonna happen. We are just small fry. There is still only one Volume in the data window, without further info about what kind of volume is it (tick or traded). Well at least the new email protocols will be useful for me. I was kinda hoping when adjusting the on screen alert handle a horizontal line spanning the entire chart would appear which would make it much easier to apply precisely without having to nudge it until it is just right. Maybe next time. And still no freehand drawing tool. Did you try giving suggestion to Service Desk? The best thing that if you do not open the tabs and not to use search engine, nothing loads and resources are not wasted. all of my (b633) terminals download signals.dat without opening the signals tab. How could I test new indicators and experts, whether the new code runs correctly on 625? All my test terminals keep updating to 633, and I have no chance to support and verify code on the publicly used build 625. Install a 625 in program files with UAC turned on. It will be impossible for that terminal to auto-update without your Admin permission.